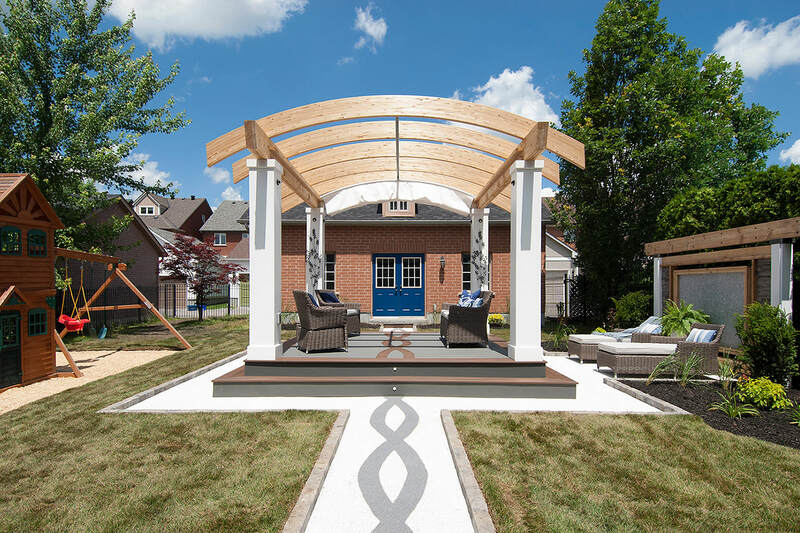 For this ‘Decked Out’ Project, Paul LaFrance Design and his team of “Decked Out” contractors had a wide-open canvas to design, create and build. The backyard had a lot of space but very little purpose. 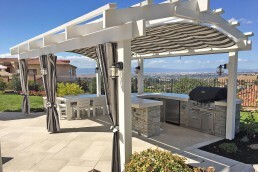 For LaFrance and co., the goal of this project was to ‘bend the rules’ to provide homeowners with a deck that could be enjoyed in the sun, shade or rain. The homeowners were hoping for a versatile space that would allow them to entertain and dine family and friends. 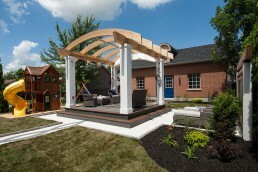 An important aspect of this was to make them feel comfortable, the backyard had a lot of sunlight, but shade was necessary to avoid getting ‘roasted in the afternoon’. LaFrance came up with a concept that consisted of three separate decks: the walkout, the kitchen and the main deck lounge, all intricately connected by a beautiful inlay that stretched throughout the space. 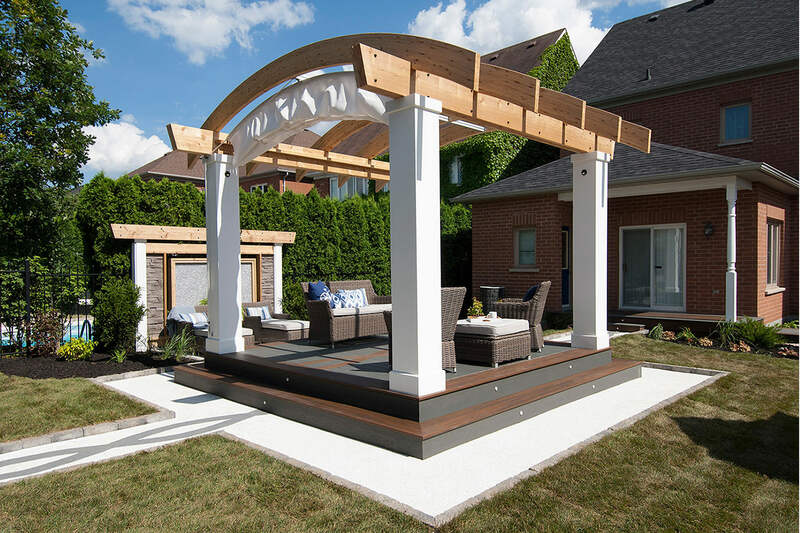 After framing the deck, installing floorboards and putting the final touches on the landscaping, LaFrance made functional aesthetics a priority. The next step was ‘up’, or as he put it, “What’s going on in the air, big columns, curved beams, awnings, a lot of really cool stuff, can’t wait, cause that’s my favorite part”. 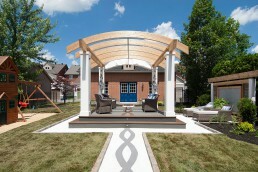 After installing the curved cedar pergola beams, the focal point of the entire design, the ‘Decked Out’ Crew easily installed the ShadeFX single-track system. 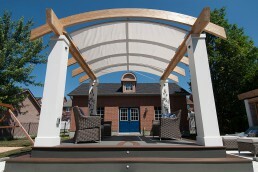 Because of our single-track system, the arched retractable awning easily contoured to the shape of arched pergola beams, a rare luxury in the awning business. 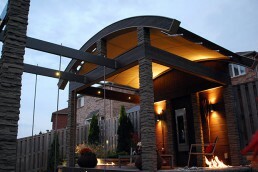 When finally presented to the homeowners, they were ecstatic by both design and functionality, especially the addition of their ShadeFX retractable canopy, which according to one of the homeowners, would give them ‘the best of both worlds”. It is always a pleasure to be featured on the show, and we look forward to helping Paul LaFrance and his crew ‘deck out’ some more backyard spaces in the future!